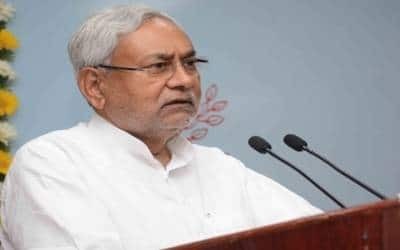 Patna, April 16 (IANS) Bihar Chief Minister Nitish Kumar and his deputy Sushil Kumar Modi filed nomination papers on Monday for the April 26 Bihar Legislative Council polls. Health Minister Mangal Pandey, along with three ruling and one opposition candidate, also filed his nomination on the last day of the filing. Others who filed their papers include BJP leader and former Union Minister Sanjay Paswan, and Janata Dal-United’s Rameshwar Mahto and Khalid Anwar. Opposition Congress leader Prem Chand Mishra also filed nomination papers on Monday after his party which is part of the Rashtriya Janata Dal-led Grand Alliance along with Hindustani Awam Morcha (HAM) — announced his name on Sunday. The names of the ruling JD-U-BJP candidates were also announced on Sunday. Eleven Legislative Council seats will fall vacant on May 6 requiring the biennial elections. On Saturday, former Chief Minister Rabri Devi, Santosh Manjhi, son of another former Chief Minister and HAM chief Jitan Ram Manjhi, RJD state President Ram Chander Purve and Mohsin Qadir filed their nomination papers. While the terms of 10 sitting members will end on May 6, one seat fell vacant when Narendra Singh was disqualified on January 6, 2016, two years ahead of the end of his term.